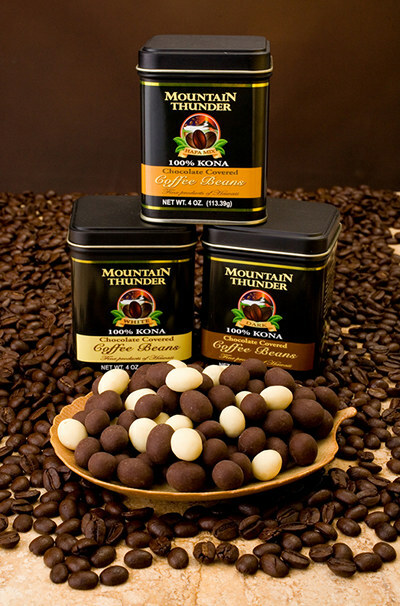 Our famous Chocolate Covered 100% Kona Peaberry Coffee Beans are back for a limited time! For those of you that are not familiar with this tasty delight with a caffeine kick … we take roasted Peaberry Coffee beans (100% Kona of course) and have a local Kona boutique candy company cover them with gourmet quality semi-sweet chocolate or white chocolate. When you taste the smooth gourmet chocolate with the crunchy roasted Kona Peaberry coffee you will be hooked for life! We offer chocolate Peaberry in our farm store year-around, however, due to shipping conditions we only ship during the colder winter months, and we only ship UPS 2 Day Air on Monday through Wednesday to assure your shipment is not sitting in a hot truck somewhere. What do you have when you take the finest roasted coffee beans and then coat them with premium chocolate? Our Chocolate Covered Peaberry Coffee Beans are a treat like no other. The smooth, rich chocolate coating on the rare (less than 5% of all coffee beans) peaberry bean make this the perfect combination of sweetness and bitterness. Great for those who love chocolate and coffee! The size is 4 oz.